Point.360 is a full-service entertainment media company offering episodic and feature picture finishing, content management, audio, localization, quality control, film scanning & restoration and media storage services. For almost 30 years, Point.360 has been at the forefront of technology, utilizing the latest methods in file-based workflows, Dolby Vision and HDR-10 color-correction, Dolby Atmos sound, Streambox remote viewing and much more. But don’t worry, we still have a one-inch machine lying around if you want to go back to the basics. We can color, edit, create visual effects, design motion graphics, mix, QC and deliver your productions in every configuration possible. If you need it in Spanish, French or Klingon, we can do that too. And our audio department has a complete Foley stage if you feel like mimicking footsteps in the snow or the lasers of a Martian armada. Our media storage facility is one of the largest in the country, with state-of- the-art security and online inventory viewing. Hopefully that sort of thing excites you as much as it does us. Got some old 35mm prints in a salt mine that need some love in the time of digital? Yep, we can handle that too. Find us in two convenient locations. 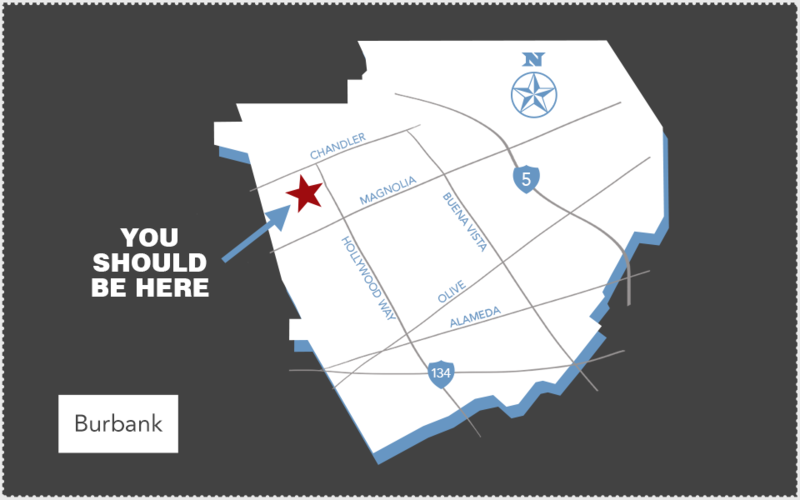 Our Burbank building is a stone’s throw away from some of our favorite institutions: the Magnolia Park shopping district, Atomic Records, the Chandler Bike Path, and of course, Porto’s Bakery and Café. 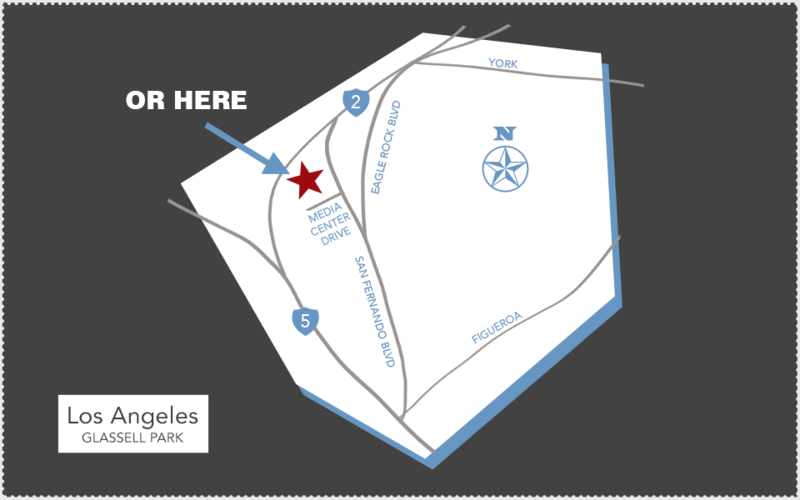 Our Los Angeles location is in the heart of northeast LA, near the trendy shops of Atwater Village, buzzy York Avenue and the newly restored Rio de Los Angeles State Park. We could go on, but we like to keep our content paragraphs short. Point.360 is a Netflix Post Partner. Point.360’s Creative Services division has a full offering of all of the usual suspects; HD, 2k, UHD, 4k and HDR workflows, color-correction with DaVinci Resolve, dual-platform (Flame and Avid) conform editing, VFX, motion graphics and dailies. We like to think our friendly, experienced team and groovy rock ‘n roll facility set us apart. As you walk the halls, you’ll find the walls are lined with photographs of some of the greatest musicians and artists to ever live. We find it helps spark our own creativity, and we hope you’ll feel the same! But our edge doesn’t just come from Jimi Hendrix photos and our fun atmosphere; beneath it all is the strength of our technology. Each of our bays is outfitted with the latest innovations in creative software and hardware, including Streambox viewing in case you need to stick around the office or don’t feel like dealing with the 405. When coupled with our expert team, this technology will make your sessions run more smoothly than ever before. Curious? Set up a tour and check us out. Dead pixels and audio tics can’t hide from us! Point.360 offers master-level quality control with over 30 rooms utilizing our proprietary systems built for 24/7, fast turn-around service. Boom mics, audio dropouts, framing issues, errant marker tape, old-school dirt; we’ve got you covered. Your content is protected with our state-of-the-art security and file-management systems. Our expert operators deliver consistent quality and detailed, accurate reports. Point.360 is proud to be a Netflix Post Partner. Need 3 seasons of a show in Spanish? Has your feature found a following in Finland? Travel the world of international voices and text with Point.360’s in-house localization department, Visual Sound. Need 3 seasons of a show in Spanish? Has your feature found a following in Finland? Travel the world of international voices and text with Point.360’s in-house localization department, Visual Sound. We have a full array of services, including subtitling, foreign language dubbing and closed captioning. In addition to its in-house staff of editors, QC operators and translators, Visual Sound has a robust network of more than 1000 freelancers and translators in every corner of the world, able to deliver product in more than 50 languages. Trés bien! Full in-house operations, include script-writing, voice-casting, recording and mixing. Partnership with Canadian Audio Describers provides additional resources and scalability when necessary. Point.360’s content management team believes that value comes from specialized workflows, a flexible staff, and innovative technology, which is why we’re able to service digital assets for all major platforms. Point.360’s content management team believes that value comes from specialized workflows, a flexible staff, and innovative technology, which is why we’re able to service digital assets for all major platforms. Our file management systems are built to store and track files for as long as you need them. If you’ve lost your keys or your wallet, you may be on your own, but if you’re trying to find an entire season worth of audio stems for your show, we’ve got you covered. Whether you are mastering content for international distribution, localizing files for world-wide delivery, or embarking on a major archive initiative, our content management team will elevate your potential in the global marketplace. Point.360 specializes in international M&E. We also have two ADR rooms, three Dolby 5.1 edit suites and five Dolby 5.1 mixing suites. All of these are located in the same building as our creative services department making us a post-production one-stop shop. Point.360 specializes in international M&E – we do thousands of them every year. In fact, as you’re reading this, we probably just finished another one! To make this all possible, we’ve dedicated an entire floor of our Burbank location to our audio department. We now have a brand-new 7.1.4 Immersive Dolby Atmos Mix Suite! In addition, we have two ADR rooms, three Dolby 5.1 edit suites and five Dolby 5.1 mixing suites. All of these are located in the same building as our creative services department making us a post-production one-stop shop. Point.360 offers high resolution film scanning up to and including 4k resolution. Point.360 offers high resolution film scanning up to and including 4k resolution. Utilizing pin registered technology will result in your scans to be as steady as the day the film was shot. In conjunction with our pin registration, we also offer proprietary grain/noise management tools as well as a complete, resolution-independent complement of restoration tools. This combination of tools allows us to give new life in older titles and hide anomalies that were not removable before, and even the most nitpicky film buffs will be impressed by the visual fidelity of your classics. As digital platforms continue to dominate the marketplace, keeping the titles in your library in good condition has never been more important. We’ll help ensure that your most important titles maintain the highest level of quality and don’t fall behind the times. Just because we’re living in the age of digital files doesn’t mean that physical media can be ignored. Built in the classic days of tape, our Media Center was engineered with the needs of your most delicate material in mind. Just because we’re living in the age of digital files doesn’t mean that physical media can be ignored. Built in the classic days of tape, our Media Center was engineered with the needs of your most delicate material in mind. Our precisely calibrated climate control and fire safety systems will protect your material from the elements, while our proprietary security process keeps it safe from prying eyes and sticky fingers. Cinephiles are still mourning the classics that have been lost to subpar preservation conditions, and we want to make sure your material doesn’t join the list. The storage and retrieval of your material is made simple thanks to our comprehensive asset tracking. Material deposited at any Point.360 facility is barcoded and entered into the Point.360 management system. As soon as you need it, the material can be easily made available and transported to the Point.360 location of your choice via our fleet of secured vehicles. Netflix, Amazon, Apple, ABC Studios, 20th Century Fox, Food Network and Blumhouse Productions.